I’ve just finished reading The Girl with Glass Feet by Ali Shaw which was one of the books I was given for Christmas and I’m in two minds about it. On the one hand it’s an impressive debut novel with characterisation which grips and shakes you as it touches on the lives of a diverse group of people who are connected by their experiences in an metaphorically incestuous community on the remote island of St Hauda’s Land. On the other, the narrative weaves these stories together as if they should lead the reader somewhere and I don’t see the point in a red herring outside of crime fiction. For me, they only detract from the story being told here. It’s as if Shaw hasn’t decided whether he’s writing a fairytale or a story which contains magic realism. It might seem trivial, irrelevant even, but to me they are very different genres and while I’m in favour of a little generic cross dressing, I think that these genres can’t be fairly combined without creating a story which isn’t entirely satisfactory. If we take Ida’s feet as the main story and bring with that the associated stories of Midas’ father, Henry Fuwa and Midas’ mother, Carl Maulsen and his obsession with Freya… good, you’ve got a great story and it’s worth reading the book for this. But then you look at the extra touches that have been thrown in and they become red herrings which, if the story was a fairytale, should lead to resolution and, if it is intended as magic realism, begin to look like little more than creative conceits. What, for example, is the point of the constant references to the creature which turns everything it looks at white? What is the point of Midas’ father’s letter? By the time I finished the book, I felt underwhelmed by what should have been a really moving conclusion because I was still waiting to see why the author had devoted so much attention to writing about these details which were never revisited. I can’t believe that got past an editor without a request to slash either the simile or the metaphor. But worse for me was the inclusion of occasional mistakes which should have been picked up by anyone who read the final draft of the book. For example, on page 81 of my copy, Denver is described as “a mouse-haired seven-year-old with a grin full of disorganized teeth” then on page 82 as “an earnest child with a whizz of ginger hair, eyes too big for her freckled face and newly grown adult teeth overlapping like a hand of cards”. Why do we have the double description of her teeth, let alone the conflicting descriptions of her hair colour only a page apart? This will seem very petty, but the litter of awkwardly flowery language and silly oversights, coupled with unnecessary red herrings and plot holes really did detract from my enjoyment of what was otherwise a really imaginative story with great potential. Have you read this book? How did you feel about these points? This entry was posted in Book Reviews and tagged books, entertainment, literature, writing on January 22, 2013 by Siobhan. 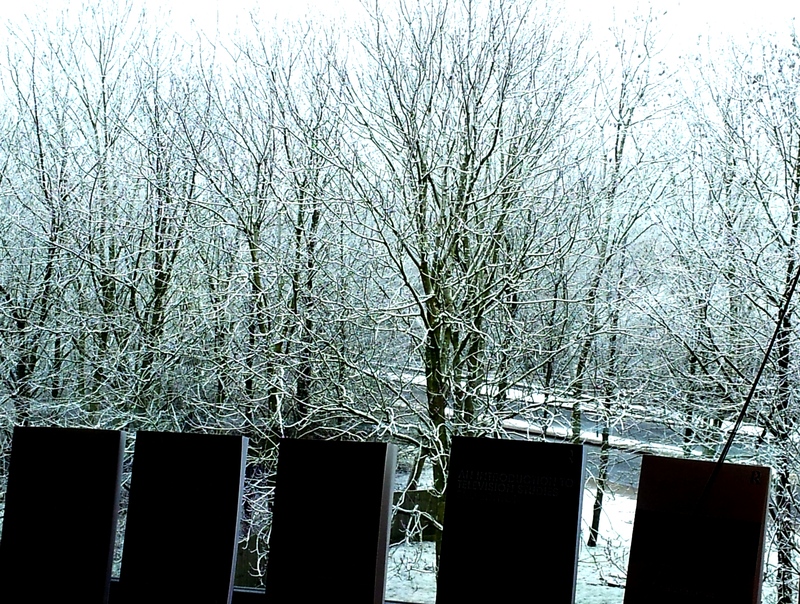 This entry was posted in Uncategorized and tagged books, snow on January 16, 2013 by Siobhan. Jacob Portman always thought his grandfather’s tale about fleeing from Poland to escape monsters who he later went on to fight was something like a fairy, a tale he’d concocted to articulate the horrors of life during World War II to his small grandson. But when Jacob is sixteen, a horrible family tragedy occurs. Soon, Jacob finds himself travelling from Florida to Wales, in search of Miss Peregrine’s Home for Peculiar Children. It isn’t long before he begins to wonder whether there might have been more truth in his grandfather’s stories than he could possibly have imagined. Miss Peregrine’s Home for Peculiar Children is a haunting fusion of photography and narrative. 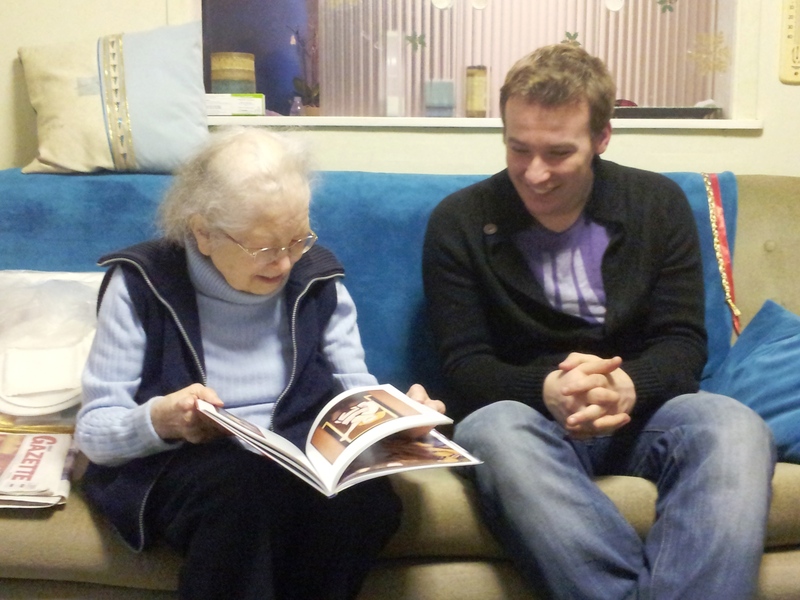 It represents a labour of love for Ransom Riggs (is this his real name? it’s amazing) and his fellow collectors who salvaged the vintage photographs which are a key part of this eerie scrapbook novel. Though the photographic element of the novel is compelling, this is in no way a gimmick to sell an inferior piece of writing. The story and characters would be engaging on their own, but the photographs do add a disturbing realism to this tale of the paranormal. The designer and production team deserve some kind of award, it’s a real work of art. Upon finishing this novel, I not only wanted to know when the follow-up is due(Quirk Books has an untitled Miss Peregrine sequel as being available from June 2013, no cover design as yet) but found myself wanting to know more about the improbably named and wholly brilliant Ransom Riggs. Wikipedia tells me that he is an American author, but he must have spent some time around the Welsh because even as an enthusiastic (and slightly prickly) Welshie, I found myself laughing at the realistic representations of Anglo-Welsh dialect “I said shaddap, ya dozy bastards” and the slightly Chavvy boy rappers Dylan and Worm, who might easily have been inspired by Maggot and his friends in Goldie Lookin’ Chain. Not only am I looking forward to reading about Ransom Riggs’ peculiar children, but I will be experimenting a bit more with titles from Quirk Books. Pride and Prejudice and Zombies was a little gimmicky for my liking, but I think that Miss Peregrine’s Home for Peculiar Children demonstrates a genuine commitment to a more experimental type of publishing and they have to be applauded for this. I’m really excited about some of the promising sequels being released in 2013! This entry was posted in Book Reviews and tagged books, entertainment, photography, Quirk Books, Ransom Riggs on January 14, 2013 by Siobhan. When a Green Wind arrives at the kitchen window offering to take September to Fairyland, she puts aside her washing up and climbs straight onto his Leopard to fly away and seek adventure. When she arrives at Fairyland, she discovers that a wicked Marquess is ruling by terror- fairies and dragons are banned from flying, witches who displease her are being killed and children are being selected at random to be sacrificed as a tithe to the Glashtyn. With the aid of a Wyvern (who thinks his father was a library) and a Marin, September sets out to set Fairyland to rights. But will she succeed? And will she ever make it home? These vanishing acts were the only thing about the book that I found unsatisfactory. Otherwise, it was a great book to read as my first book of 2013. 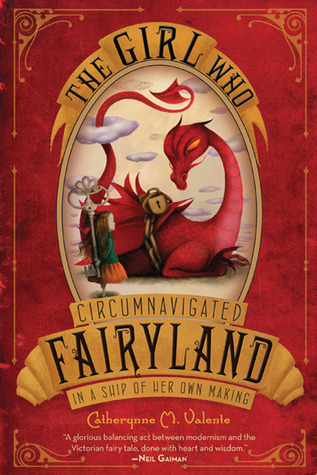 The Girl Who Circumnavigated Fairyland in A Ship of Her Own Making is the first book in a planned series of five by Catherynne M Valente, and having read the first, I’m looking forward to the rest of the series. It has all the makings of a brilliant cross over novel which will appeal to both children and adults- great characters, a strong plot and a seemingly simple but hilariously knowing narrative. Fairyland was charming and enticing while retaining a sufficient threat of danger beneath the surface, and even though this is a book which would make a great bedtime story for children aged eight and up, there were moments when I felt genuinely anxious for September and her motley crew. I’m really looking forward to the next book in the series, The Girl Who Fell Beneath Fairyland and Led The Revels There, which is released in the UK this month. Catherynne M Valente has also written a prequel to the series The Girl Who Ruled Fairyland- For A Little While. This entry was posted in Book Reviews and tagged books, entertainment, fairytale, magic on January 12, 2013 by Siobhan. A few years ago, my grandmother gave her copy of a book by her favourite artist to her friend while she was in hospital to cheer her up. Sadly, her friend then died. My grandmother always talks about how much she loved the book and how much the pictures used to make her laugh, so for Christmas, despite knowing very little about art, I resolved to track down a copy for her. It was surprisingly easy. I just did a quick search for “artists who paint fat ladies” and Beryl Cook’s name came up along with some very familiar looking paintings of fat ladies. Old ladies, they think they can get away with anything! This entry was posted in Direct Speech and tagged art, books, Christmas, family, grandparents on January 8, 2013 by Siobhan. If you’re the kind of person who appreciates the joys of paper and ink in a digital age, head over to Hickory Nines and read this fantastic post by my colleague Lisa. It’s a lovely read and I think you’ll agree that she has a wonderful way with words. This entry was posted in Direct Speech and tagged art, books, print on January 8, 2013 by Siobhan. 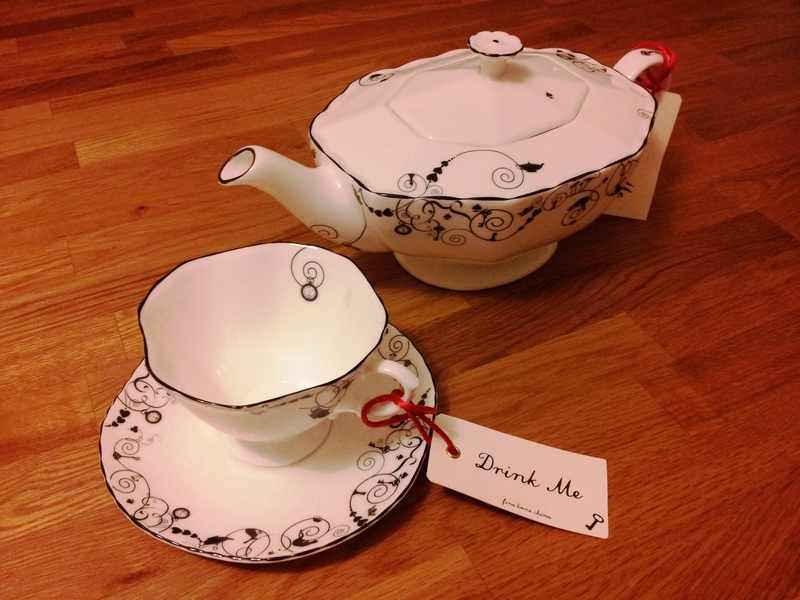 In addition to my Christmas Book Haul, I was lucky enough to receive a Alice in Wonderland tea set from my boyfriend. Isn’t it gorgeous? I love the little watch, cat and bird motifs. There are even little hearts and spades if you look closely. The only problem is, I think it might be a little too beautiful to use! I’m scared I will break it. 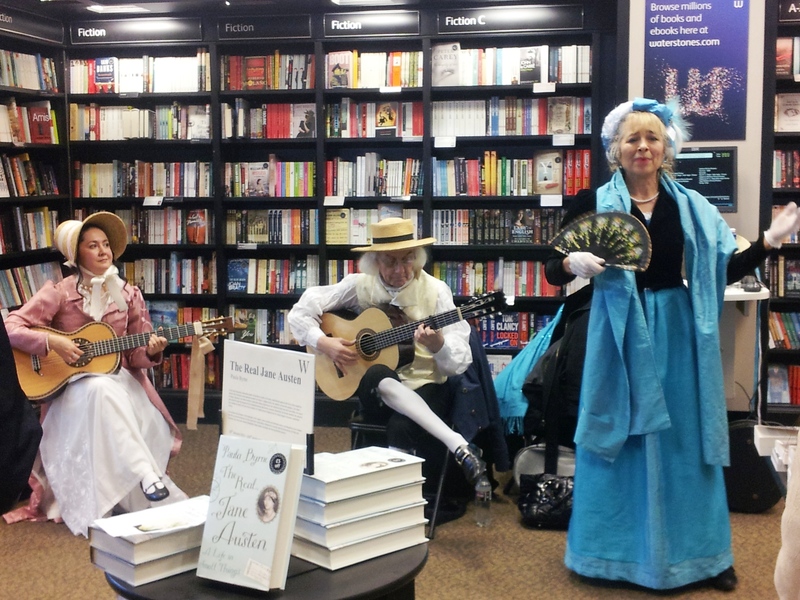 This entry was posted in Fun Stuff and tagged books, food, lifestyle, tea on January 7, 2013 by Siobhan. I’m sure (ahem) that you’ve been waiting in a state of frenzied anticipation to see what books my family and friends got me for Christmas. I’ve finally managed to get my lazy bum in gear and dig out the camera to share the book love… ta da! A definite fairytale theme going on. I’m looking forward to reading them all. 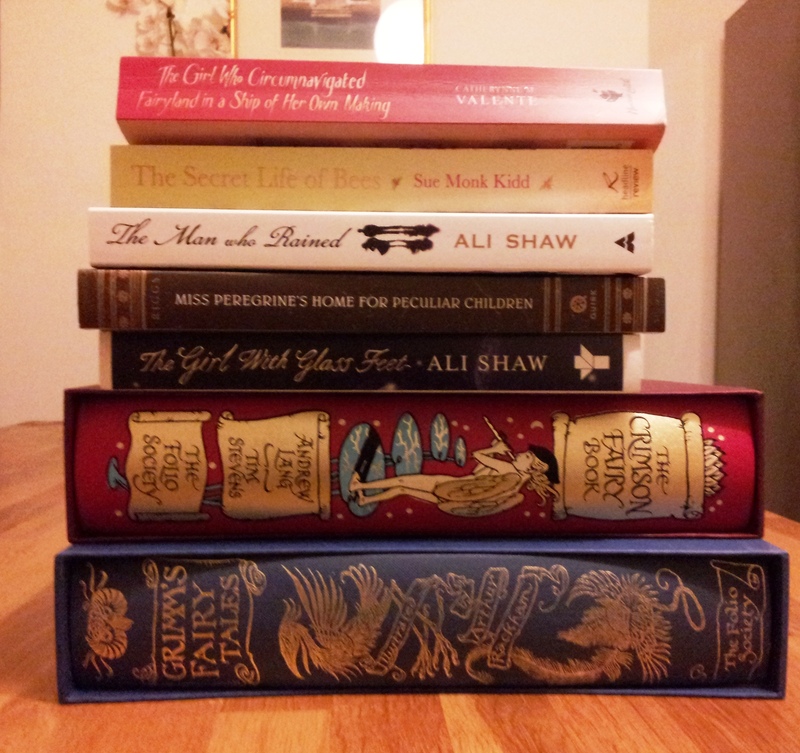 This entry was posted in Uncategorized and tagged books, Christmas, reading on January 6, 2013 by Siobhan.